We closed out the short week on Thursday with a pair of last minute options ideas, and both of those provided our readers and ourselves with the opportunity to take significant intraday profits. We highlighted this play at the end of last month, and shortly thereafter we would observe a low of .7772. Last week, MBRX reached a new high of 1.47, which translates to a gain of 89% in roughly three weeks’ time. The move, which filled the entirety of the topside gap on the chart, was due to Thursday’s revelation that the company’s drug Annamycin had received the FDA’s Approval for fast-track designation. At 4:30PM on Wednesday, MBRX officials will conduct a call to discuss this and other developments on a live webcast, which will be available in the Investor Relations section at www.moleculin.com. 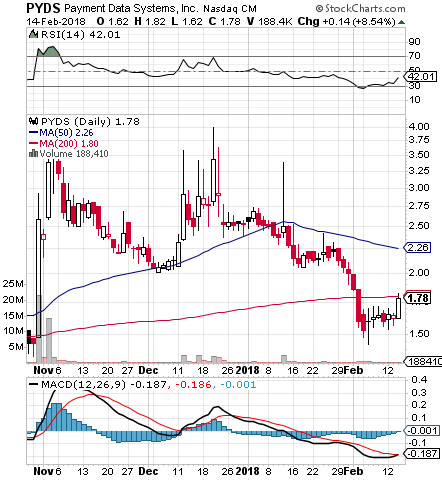 Aytu BioScience, Inc. AYTU Yesterday morning, we were just discussing AYTU and the modest progress the stock had made since we flagged it as a bottom play in Wednesday’s premarket report. Not only had it displayed a cherry bottom setup, but we noted a string of insider buysat the time as well.Following that report, we would witness a low of .4118, and over the course of the ensuing four trading days, the stock has made a noteworthy move and continues to exhibit signs that more gains could be in store. Yesterday it reached .61, which represents a run of 48% in under a week. It did so on record volume, so we’re definitely eager to see where the momentum could carry this play that was already on its way back up. NSPR has been in real trouble in 2018, losing ground at seemingly every turn and unable to get out of its own way. However, through a combination of a South American breakthrough announcement for two of the companies drugs, and being just plain oversold, we’re seeing a marginal premarket gap-up and will want to observe for a more sustained rebound. After a period of a couple of trading sessions where WMT has taken considerable abuse on the chart. After appearing to be gearing up to make an impressive run, the stock gapped down considerably on Tuesday and the backslide persisted through yesterday. This major selloff has brought the stock down to its lowest PPS since November, and had us thinking about a range of calls to slate for observation in the days and weeks ahead. We’re going to signal the WMT 03/16 $90-93 Calls, which should be in line for some solid activity if Walmart mounts the recovery that, at this point, looks very possible. 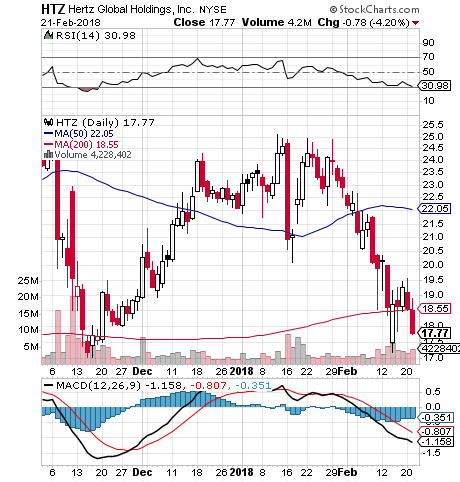 We would like to put HTZ on watch as a possible bounce play this morning. As you can see on the included chart snapshot, the stock is giving off a strong double-bottom signal, and just fell below its 200DMA yesterday. We’re going to monitor the activity here closely, because as you can see, there is a considerable amount of room to run to the upside, and the stock has been approaching heavily oversold territory. While we’re on the subject of car rental agencies, our eye has also been caught by Avis, whose stock just came down to an area of trendline support, and also posted a Q4 earnings beat. We’re going to look for opportunities in the CAR 03/16 $42-44 Calls in coming sessions. We mentioned the possibility of further gains for the calls we signaled in the Under Armour options chain on Tuesday, the UAA Weekly $15.50-16.50 Calls. The markets pulled a head-fake, and ended up going green, which helped allow the stock to make to more than $18. That created huge opportunities in our highlighted plays, which went quickly from double-baggers on Tuesday, to a triple, a quad, and even an octuple-bagger! We are looking at PYDS as a bottom-bouncer with just the kind of chart setup we like. The stock spent nearly all of January and the beginning of February under heavy consolidation down to its lowest PPS since October. In the last couple of weeks it has shown signs of a solid turnaround. As you can see below, the RSI is coming off of being oversold and presently cruising toward the 50-line, the MACD is in the midst of a bullish cross, and yesterday saw the testing of the 200DMA. PYDS also has a recent history of rapid runs up the chart, also visible on the included snapshot, so we’ll be keeping a close eye on it in the coming days. BioMarin had a really solid performance yesterday after we signaled some contracts in our premarket report, the BMRN 03/16 $80 & 85 Calls. The stock ran from 81.01 to 84.19 facilitating some modest but solid intraday moves in our contracts. With a strong close at 83.28, and a lot of ground to cover to recoup the losses the stock has seen in the month of February, we’ll look for BMRN to establish a more sustained recovery pattern, and we may see some further increases in these contracts, which still have over a month until expiration. We want to formulate an idea for Under Armour on the heels of the company’s earnings report this morning. The stock had already begun to trend off of its bottom a few sessions ago, and despite posting a Q4 loss, sales were better than expected and the stock is gapping up pretty significantly here in the premarket. We’re going to want to keep tabs on the UAA Weekly $15.50-16.50 Calls, which could bring us sizable gain opportunities in the day or days to come.